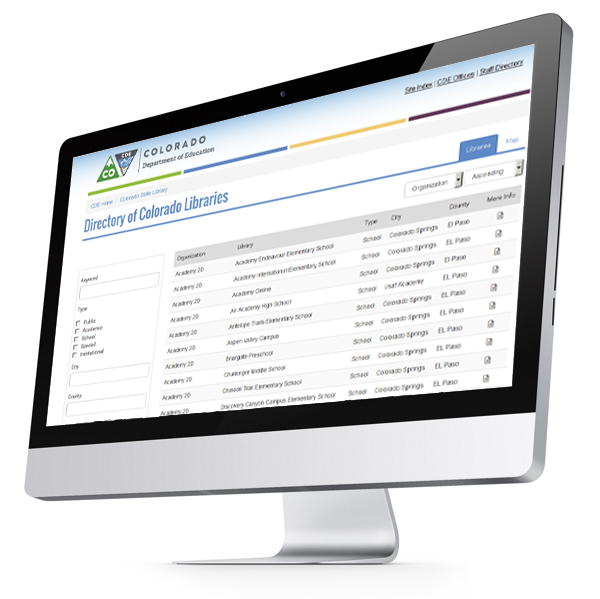 Welcome to the new Colorado Library Directory, provided by the Colorado State Library with funding from the Institute of Museum and Library Services. The Library Directory recently had a face lift...nay...more like a complete body transplant...and we know that you will like what you see. Keep on scrolling to learn more about the new and exciting features, or dive right into the data. 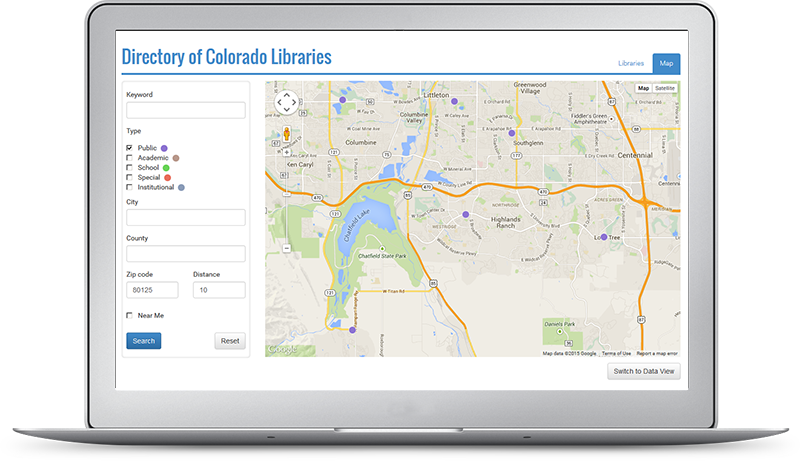 View and search Colorado libraries using the Directory's new map tool. For example: view all libraries within 10 miles of zipcode 80125. Want to see all libraries within 5 miles of your current location? Easy! Select the "Near Me" option. 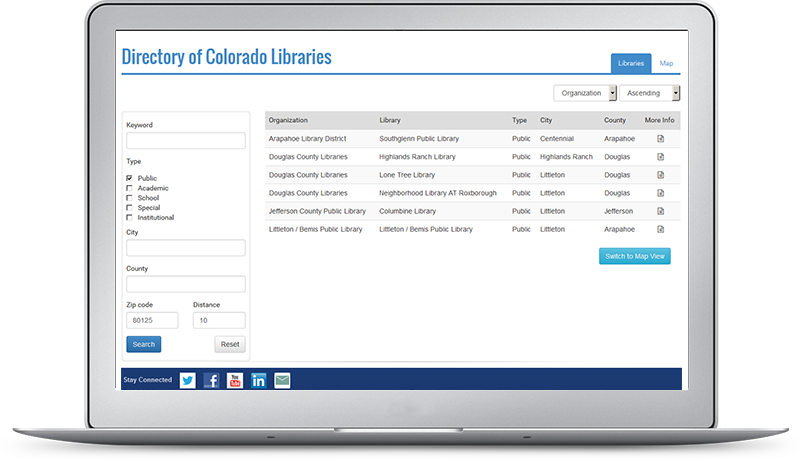 Finding libraries in Colorado has never been easier thanks to the improved search feature. Filter results by keyword, library type, or location. You can also search for libraries in/around zipcodes. 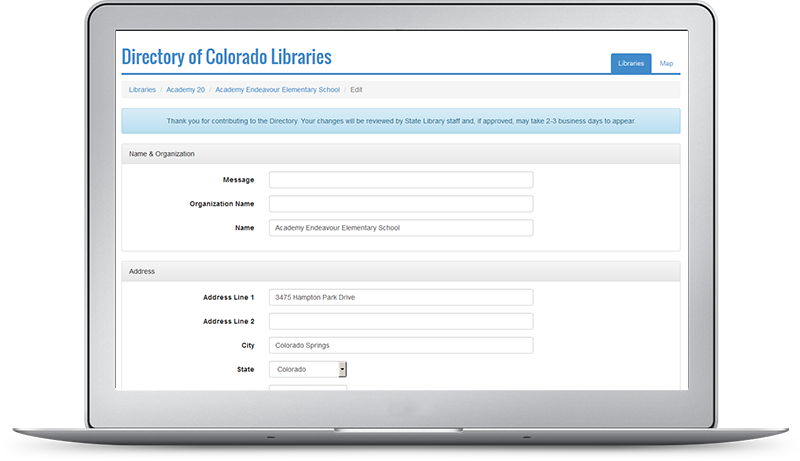 Integration with Library Research Service's Public and School Annual Report data ensures accurate and up-to-date info. A powerful new API makes it easy for users and developers to interact with, and build new services around, Directory data. The Directory's new style adapts to a wide range of devices. Now go forth, edit, and help us provide accurate data!